Is there any better marriage of flavours than chocolate and cherry? A staple of British dinner parties in the 1970s, the Black Forest Gateau fell from favour soon after. But we’re now seeing many revivals of this dessert and now Victoria brings a pavlova version. Heston Blumenthal did his best to bring back the Black Forest Gateau with his poshed up version at The Fat Duck in recent years, but I thought I’d attempt my own, more modest, revival of this classic. It’s hard to beat a Pavlova in the summer months. They’re a cinch to make, gloriously moreish to eat and naturally wheat-free; which means all the gluten dodgers in your life and mine needn’t miss out. 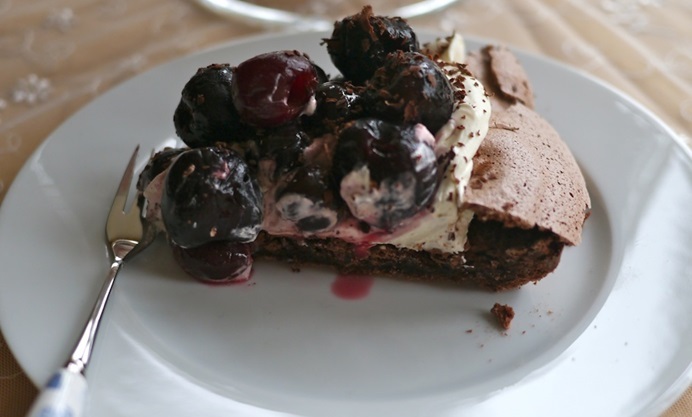 This can also be made well ahead of time, so there won’t be any last minute pudding panics and you don’t need to bung it in the fridge until after you’ve smothered it in cream - which is extremely useful when your fridge is as micro-sized as mine. The only relatively laborious process to this recipe is stoning the cherries. You’ll have to have a very dishy dentist to risk skipping this stage for, but I rather like the mindless repetition of sitting down with a large bowl of cherries, catching up on taped telly, and getting to work using my new fancy gadget. Be warned, you will end up looking like your hands have been marinating in Ribena for the last fortnight, but what are a few stains between friends? You can always pop on some latex gloves if you’re precious about your pinkies. Besides, cherries aren’t in season for much longer and I, for one, will miss them when they’re gone. I will be dishing up this decadent dessert over the weekend and I can promise you won’t regret it if you follow suit. 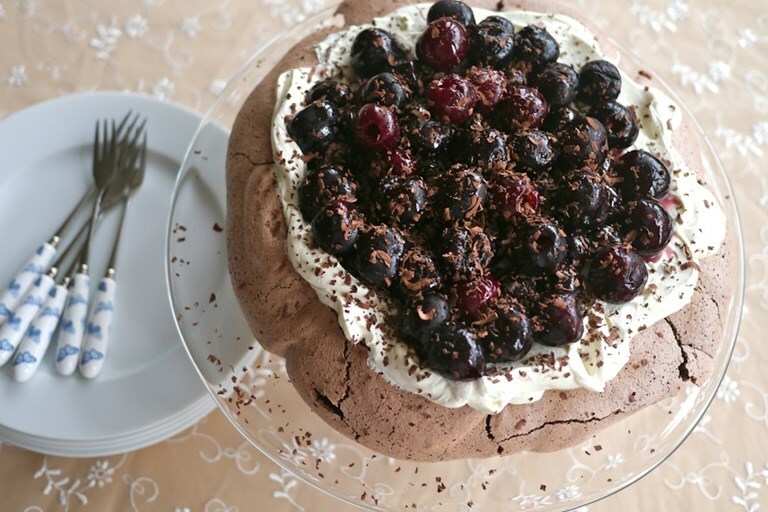 This Black Forest Pavlova makes a stunning centrepiece to any celebration, no matter the occasion, or the decade.